If you'd been on the streets of London, Paris or New York in the late 1880s, you'd have seen two types of bicycle: the "Ordinary," or penny-farthing, and the "Safety." By 1895, the Ordinary had virtually disappeared and the Safety, looking very much like the regular "diamond frame" bike you see around town today, was everywhere. In addition to opening up the world of cycling to men who had previously been intimidated, the Safety bike broke what had been a male-only gender barrier. "A sudden desire awoke in the feminine mind to ascertain for itself, by personal experience, those joys of the two-wheeler," wrote a correspondent to The Wheel magazine in 1888. By the early 1890s, one third of riders were women. The Ordinary was a challenge, and not just to ride, since mounting and dismounting demanded the skills of a gymnast. In use, riders sat high over 4-foot-plus diameter front wheels, legs perilously close to the spokes, every pothole and obstacle on the dirt roads of the day portending a header over the handlebars. Safety bikes changed all that: Smaller wheels (made possible by a chain drive coupling a large pedal-driven front sprocket to a smaller rear-wheel sprocket) brought the rider much closer to the ground, with legs now clear of the wheels. Most importantly, hitting an obstacle didn't automatically result in a precipitous tumble. The Safety's smaller wheels gave it a harder ride compared to the Ordinary, but the invention of the pneumatic tire by a Scottish veterinarian, John Dunlop, soon took care of that. 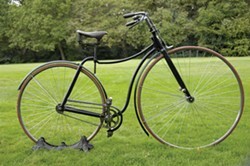 Within a few years of its introduction in Coventry, England, in 1885, John Kemp Starley's "Rover Safety Bicycle" looked very much like most bikes of today with a low twin-triangle diamond frame; comparatively small diameter spoked wheels, rear wheel chain drive and a sprung and padded saddle. Other refinements followed: the freewheel (invented in 1869); clipless pedals (patented in 1895) and the derailleur gear shift (patented in 1868). The popular three-speed Sturmey-Archer internal hub dates to 1902. 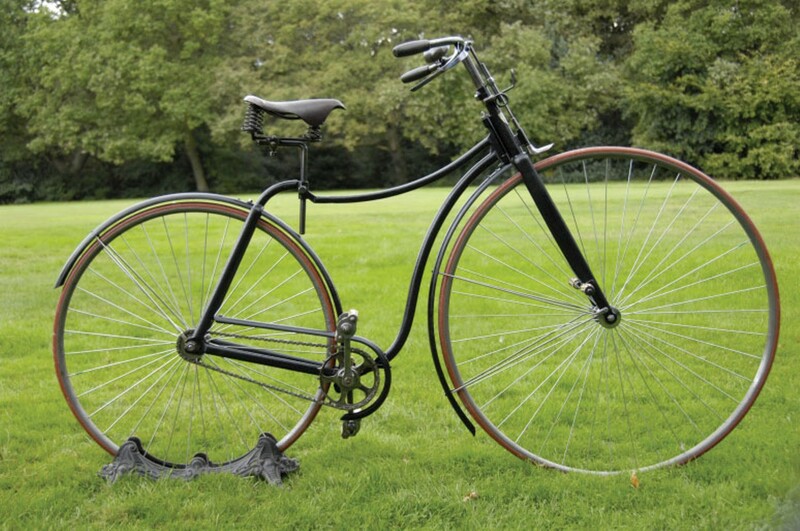 The restored 1887 Rover in the photo with its 36- and 30-inch solid rubber wheels is an intermediate design; still to come is a tube between the saddle and pedals to complete the diamond frame, and pneumatic tires on same-size wheels. With its low center of gravity, it's easy to see why the Safety quickly superseded the Ordinary, since it was much easier to get on and off, and accidents were few and comparatively minor. Best yet, women either in skirts or "bloomers" (styled on Turkish pantaloons) were as adept as men in riding the new bikes. Susan B. Anthony was unequivocal in her praise of the new machines. In an 1895 interview, she said that the [Safety] bicycle "has done more to emancipate women than anything else in the world. It gives women a feeling of freedom and self-reliance." The older Safety bicycles were remarkably effective and with subsequent improvements, today's best bikes achieve an astonishing 98 percent efficiency; 100 calories gets you 300 feet in a car or three miles on a good bike. That goes a long way to explaining why there are more than a billion bikes in the world. Barry Evans (barryevans9@yahoo.com) has seen the future, and it's commuters on lightweight, 20-inch wheel, folding bikes.